50Stars Casino is owned by iGlobalMedia Entertainment Limited, a subsidiary of ElectraWorks Limited and it is managed by Global Gaming Net (GGN). The casino is licensed and regulated by the Government of Gibraltar. It focuses on safety and security and employs the latest data encryption technology and firewall products. It has a good variety of games, 24/7 customer support and worthwhile bonuses and promotions. 50Stars Casino is powered by the online casino software provider, Playtech. The software is available in a downloadable version, as well as a no-download instant flash version. There are plenty of games for players to choose from, including card games, table games, video poker, slots, video slots, arcade games and progressive games. Some of the games include blackjack, baccarat, red dog, European, American and pro roulette, craps, sic bo, keno, bingo and more. 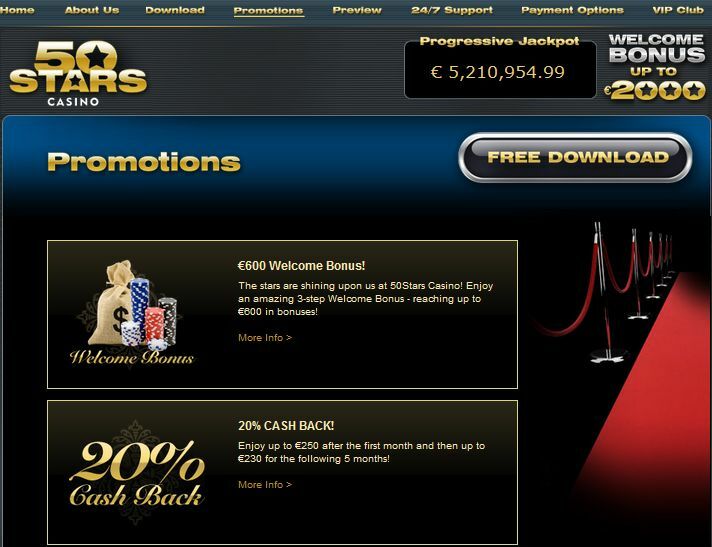 New players at 50Stars Casino are eligible for a €600 welcome package over three deposits. On your first deposit at the casino, you will be eligible for a 100% match deposit bonus up to €200. On your second deposit at the casino you will be eligible for a 125% deposit bonus up to €200 and on your third deposit at the casino you will be eligible for a 150% deposit bonus up to €300. Players can receive 20% cash back on all deposits made with an alternative payment method from the first deposit and for the following 5 months. That means that you can enjoy up to €250 after the first month and then up to €230 for the next 5 months. Players are eligible for bonuses of between 10% and 15% when using an alternative payment method. If you invite your friends to play at 50Stars Casino you will be eligible for a €25 bonus when they make their first deposit. There are also plenty of limited bonuses and promotions each month at 50Stars Casino. Keep an eye open on their promotions page for details of these offers. 50Stars Casino runs a VIP club with three tiers – emerald, diamond and black diamond. Members of the VIP club are eligible for exclusive bonuses and promotions, as well as preferential comp points conversion rates. All players are eligible for comp points that they earn by placing bets at the casino. These points can later be redeemed as cash. If you have any questions when playing at 50Stars Casino you can contact their customer service team who are available 24 hours a day, seven days a week. They can be contacted via telephone, fax, email or instant live chat. Instant live chat is available through the casino lobby by clicking on the “online support” icon. 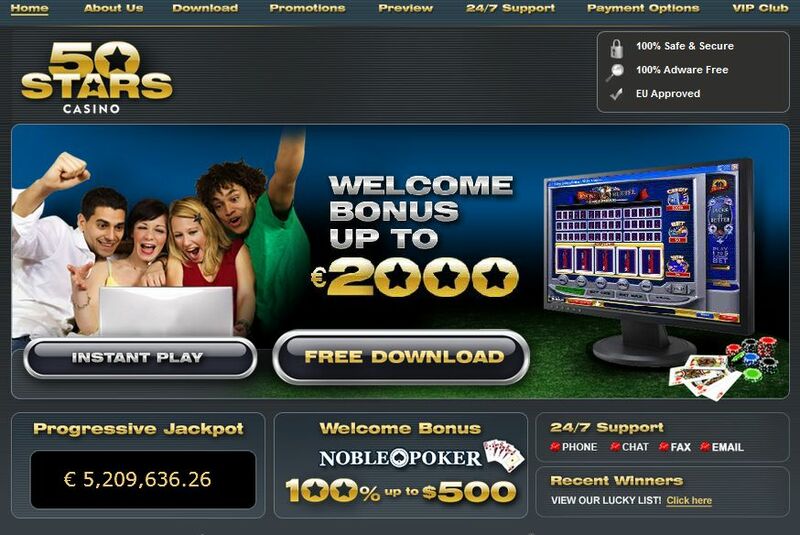 Players can make deposits into their 50Stars Casino account via a number of safe and secure options. These include VISA, Master Card, VISA Electron, Delta, Maestro, NETeller, Moneybookers, Ukash, Click2Pay, InstaDebit, Solo, Paysafe Card, Webmoney, ClickandBuy, bank transfer and Entropay. Deposits can be made in euro, British pound, US dollar and South African rand. Great Win for French Online Player at Grande Vegas Casino! Which site is offering special moneybookers bonus for online betting?